Providing Oahu's Best Party Rentals! 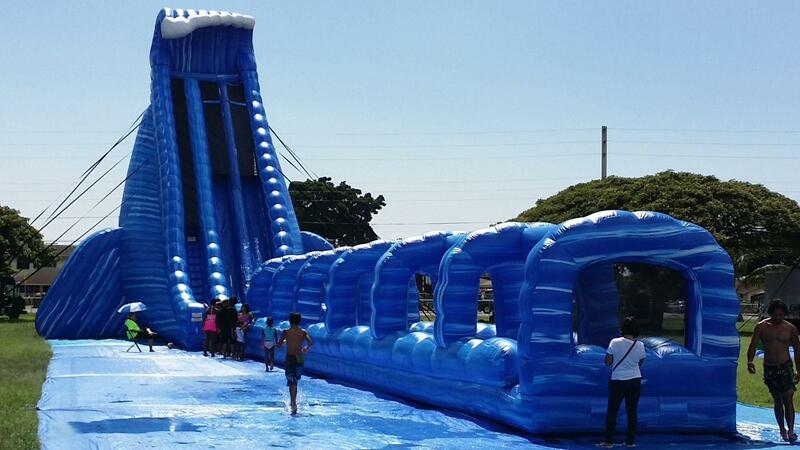 Most High Jump Inflatable Bounce House & Water Slide Rentals Oahu, Hawaii is Waikane's most amazing party rental company. Specializing in the most up to date inflatable play structures with offical licensed character themes plus not to mention the absolute biggest and fastest water slides in the State! All of our equipment are inspected and rigorously tested for safety and securement. Cleanliness is a top priority for Most High Jump. For you to have a clean and impressive looking inflatable means a whole lot to us, this is what separates us from the rest. Here at Most High Jump, before a company, we ourselves had experienced dirty and smelly bounce houses from family party's and such, to where we voweled not to ever deliver units to our customers in this fashion. Our equipment are cleaned and sanitized before and after each use, and this is our promise to you no matter if GOD blesses Most High Jump Inflatable Rentals to increase, we will remain in our integrity to properly sanitize and clean all of our inflatables top to bottom to insure our customers are getting what they paid for. Rest assured that our company is mindful of various bacteria and germs that may live on the vinyl surface if the proper cleaning was'nt taken place. Therefore if you are that customer who would like to rent a bounce house for your child, but worried about what they will get when its delivered, how clean would it be for there 1, 2, 3yr old, hands and mouth contact, allergys, etc. please call us, and we will be more than happy to share with you details in what products we use to clean and sanitize our equipment. Lastly we would like to be up and front, personal with our clients, to ensure the cleanliness and safety of our units. We our self have 7 children and 1 on the way, rangeing in the ages from new born to teens, and we know the deep measures parents take to protect our children from harm and danger. So on your next up coming party or event, consider Most High Jump as your fun, liable and safe provider in quality bounce houses and awesome water slides. We offer a convienient real-time booking system that allows you to lock-in the date and inflatable by a safe and secure deposit. Also This allows you to customize your order with start/end times and specific notations for your location of event, also add-ons, generators and packages. We provided pictures, video's and simple navagation through out our website to better further your choices for a successful and memorable event. © Most High Jump Inflatable Rentals. All rights reserved.